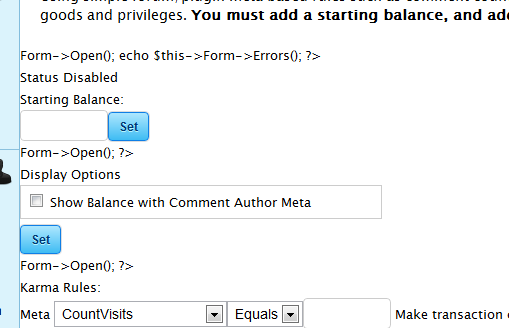 Discussion Clicking Set or Add does not function. I've installed the latest version of Karma Bank and enabled the plugin. On the settings page I see a bit of funnyness. entering a value and clicking set does not appear to do anything. clicking the add button gives the same 'non-result'. No worries. It was an easy one to track down. BTW - it would be good to have a page that explains the karma rules to the community.